Finding a great place to live in and raise a family is so elusive nowadays. But somehow, there is still a nice neighborhood where nature and humankind can mingle with each other and where one can still feel so blessed. A simple yet bountiful community, one that can be called “paradise”. Long before the Spaniards came to Antique’s shores, there was a sort of a hamlet, nestled between a hill which people called “Telegrafo” and a wide river that flows into the vast sea. The natives are living peacefully and were enjoying the gifts of nature. Vast plains ideal for farming, fish and other marine creatures that are abundantly thriving in the waters, and a view so beautiful that one need not go to other places to enjoy life. Everything seemed to be perfect in this place. When the Bornean datus came to settle in their first stronghold after they had bought that piece of land they called “Malindog,” they discovered that their families had grown so big that they seemed to be overcrowding the settlement. Some of them decided to sail a little farther up north. Then they found this ‘hamlet’ and joined the few natives who were already living here. Our story might end here if we say that from then on, they lived happily ever after. For it were not all sunny and merry days to live here. There came a time that moro pirates came to raid the settlement and took away what they saw – farm products, domesticated animals, men whom they made as slaves and they even took the women and raped them. People became afraid and so they thought of some ideas how to evade these moro attacks. They discovered that the Telegrafo hill can be a good hiding place because of its vantage location. It is high enough to serve as “palngat”. They also appointed someone to act as “look out”. One fine day the “look out” saw the moro vintas coming in from the vast seas. He then alerted his neighbors to run into Telegrafo hill to hide. To their amazement, they saw a man walking in the shoreline. He was wearing a green and maroon robe and holding a huge key. He waved to the vintas to go away and much to the natives’ amazement, the moro vintas did not land in their shores and instead backed out and disappeared in the horizon. Soon there were no more pirates raiding the place. And the community became peaceful again. When the Spanish friars came to Antique, they heard the story of that man in green/maroon robe with a huge key. Strangely enough nobody knew where this man was after that incident. The friars believed that it was St. Peter who saved the land and the people. From then on, they named the place San Pedro. History would tell us that the Spaniards, in an attempt to Christianize the province , would build stone churches where the natives could be baptized and attend church service. One stone church was built in San Pedro by the Augustinians. Shaped like a Latin cross and with a thatched cogon roof, it served its purpose in teaching Catholicism in the locality. San Pedro was even made an “arabal”. Unluckily, the stone church was damaged, first by a fire when the parish priest’s pet monkey burned its cogon roof and in later years, by an earthquake. Over time, the stone walls weathered other elements of nature and it still stood now, its thick walls and the tall belfry. Modern day parishioners saw that the walls could be “restored” so they started to clean the areas with accumulated wastes and excretion from white bats that made one of the wings its habitat. They erected the statue of Our Lady of Lourdes with St. Bernadette in an elevated plateau in the area which used to be the altar of the old church. A cascading “waterfall” flows freely into a small pool which can also serve as “wishing pool”. A San Pedrohanun who is an architect by profession designed the grotto, Harold Aurelius T. Tating with his sister Catherine Tating-Mersden. The right wing of the old church was cleaned and for three years now, has been the sepulcher of the dead Christ where every Good Friday believers flock to pay homage to “Santo Entierro” laid there for the night before the Easter Vigil. Lately another wing in the old church was renovated and became the Divine Mercy Sanctuary where people, after hearing Mass on a Sunday would light candles and offer prayers. The statues of Pope Paul VI, Sta Faustina and the Divine Mercy image are being housed here. All together, the ruins , now named as “Lumang Simbahan” can be a place for silent prayer, communing with God, whether alone or with a group, and a place for reflection or even a venue for weddings. So much has improved in this place now named San Pedro. It is also in this biggest barangay in the province that the first and only Catholic seminary was constructed sometime in the early 1960’s. It was founded by Antique’s first bishop, Rev. Father Cornelius de Witt. It is here where young men are honed to become diocesan priests. 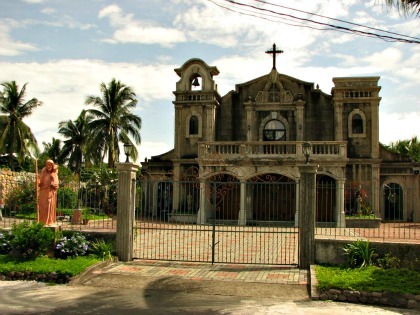 In the early part of the year 2005, the Poor Clare’s Monastery was constructed in a vacant lot at the back of the “Lumang Simbahan” in the Roman Catholic Church compound. Today there are buildings and an elegant chapel where people could attend Mass and novena to Saint Clare every August 2-11. On the 11th day of August a grand procession around the poblacion is held with the big statue of Sta. Clara/Saint Claire mounted on a caroza bedecked with flowers. Parishioners from all over the province would come and take turns in sponsoring the daily novena mass. The saint is believed to give whatever petition the faithful would ask, that’s why it is being venerated by both Catholics and non-Catholics. Just like any other barangay in the country it has also its local governance manned by competent barangay officials, a police outpost was also erected within the barangay plaza with the main purpose to serve and protect the constituents. A local food terminal is where farm products and poultry and meat, particularly from the LGU-San Jose’s “Farmville” or its demo-farm , are being sold so that barangay folks could get their supplies within reach. Naturally, as a developing and urban barangay folks go to the capital town of San Jose de Buenavista everyday to work, do business, attend school and even to shop and find some leisure. Brgy. San Pedro is just seven kilometers from the town proper of San Jose and it is accessible through tricycles and most of the residents have their own private vehicles. The vibrant hamlet which the Bornean visitors once chose to live in is now on its way to progress and yet it remains to be peaceful and a very ideal place to raise one’s family. It has a story it can tell and re-tell to the future generation and it boasts of a glorious past accented with bounties and blissfulness.